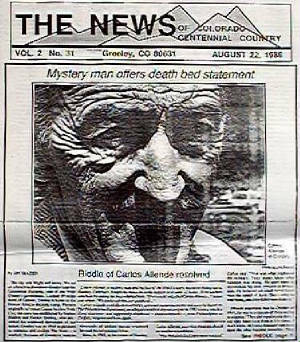 The newspaper that published the following Carlos Allende "death bed statement" story is "THE NEWS of Colorado Centennial Country," (USPS 748-510) published weekly by Old Weldpress, Inc., 627 8th Avenue, Greeley, Colorado, 80631, John J. Dugan Jr, Editor and Publisher, Volume 2, Number 31, dated August 22nd, 1986, page 1 and page 8. Every attempt has been made to duplicate the exact spelling (including misspellings) and punctuation of the original news article. It is reprinted with the kind permission of Elva F. Dugan. Carlos Allende, a mystery man and recluse of the 20th Century, has been hiding out in Greeley, Colorado. Sought by many, he is the subject of at least 22 books. Most authors conclude by asking his true whereabouts. "If we could only find Carlos Allende..." states one writer. "We could ask him our questions..."
Carlos Allende, with his own writings, spawned numerous books and a movie based on The Philadelphia Experiment, an alleged classified defense project in 1943 during which a Navy destroyer was supposedly displaced -- instantaneously -- from Philadelphia to Norfolk, Virginia and back again. The day was bright and sunny. We sat on a bench in downtown Greeley near the Centennial Building, seat of the Weld County's government. Located 50 miles north of Denver, Greeley is home to the Denver Bronco training camp. Formed originally as Union Colony in New York City, the town was established by Nathan Meeker and Horace Greeley, who promoted the westward movement of our nation. Greeley was an 1869 experiment to colonize and civilize The West - - it worked. Because of Greeley's success thousands of settlers moved westward beyond the Mississippi River. Now, in 1985, at the center of Greeley, Carlos Allende, says that America should try another experiment. "The Philadelphia Experiment worked," Carlos said. "That was what frightened the military. They didn't know what Einstein was doing. He used them to accomplish his own research in propulsion. He believed we could travel faster than the speed of light. That's what he was doing, and they didn't even know it." Allende maintains that in October of 1943, he was in a convoy of ships sailing to Algeria. "They did experiments then. I say they must have done it 144 times. I don't know. At least a thousand men have seen the ship become invisible. They radiated the target ship with electromagnetic beams. It started out as an experiment in degaussing ships so they wouldn't attract mines, and in making ships invisible to radar. But Einstein took it farther than anyone expected. He made the ship invisible to your eyes. "Einstein was on the test ship the DE168. I was on the U.S.S. Feurseth. We were in a military convoy with many, many ships. I was on the bow. There is a place where you can stand on top of thick covers, about a foot above the deck. That's where I was. The railing was curved. I hooked my left hand under the railing and leaned out as far as I could. The force field was under my nose, you might say, really it was under my chest and neck. It had spread out from the target ship. I reached into it with my right arm. It kicked. Curiosity -- they say. That's why I did it. You might say I was satisfied. I had my question answered -- for the moment. "The visibility of the force field is what disturbed Einstein and the defense investigators. As the ship became invisible the force field became visible. They couldn't figure it out. That's why Einstein came to me. He saw me put my arm in. He wanted to know what I saw, what I had felt, if I smelled anything, and why I had done it. He sort of gave me an intelligence test -- you might say. Once he realized that I did it out of a deep scientific curiosity, he spent time with me. He gave me a rapid course in the physics of invisibility during the next two and a half weeks. "Einstein and his team were using the Navy for their research. The whole group was Jewish. Steinmetz wound the coils on the beam generator. It was based on the work of Tesla, but only Steinmetz could make the winding. That little drawf -- a hunchback -- was the world's best researcher. What Einstein really was working on was a starship propulsion system. You have to realize that this was before rockets. This was before NASA's space program. This was Einstein's test of space travel -- starship drive at faster than light. "What Einstein proved was that invisibility is a precursor to propulsion beyond the speed of light. Invisibility is nothing more than the precondition to a practical utilization of the magnetic field related to the Einstein Tunnel Propulson system. There is nothing to be afraid of with invisibility. Of the many combinations of human blood type, bone type and flesh type, there is only one that remains invisible for life. Others are not affected adversely. This means that the door is open for star travel for all Americans. We must do it. We must proceed. This is the future. As Carlos talked, he nodded to people who smiled at him. The day was bright and beautiful. The morning sun was rising towards noon -- August 14, 1986. Carlos is 61. He wore tweed trousers and a jacket. In his pockets were stuffed a variety of pens and pencils, papers and notes. He was thin. On his wrists were medical braclets. He had been hospitalized with a racing heart several times during the previous week. "It must be fate," he said. "This is my death bed statement. In case I die, the questions will be answered. All except one -- that will die with me," he said. "America has had the answer since 1943. All the answers are right under the nose of NASA and the Department of Defense but they are still afraid. The secret is that the Philadelphia experiment is repeatable. It should be repeated, again and again. It will lead to star travel and to a fleet of starships capable of protecting America. Travel faster than light has been documented as a phenomenon. Now we must learn again what Einstein knew in 1943. Man can create transportation at speeds faster than light. "The first and most important statement is that the experiment is repeatable. We must do it. You must continue this research. The second thing is that Einstein came to me, and trained me in the theory of invisibility. He said they were using the Navy for his own research into Star-ship propulsion. All the Navy wanted was degaussing and radar invisibility. You can imagine their surprise. Thirdly, when the ship was radiated with the energy beam, particles were thrown off. It formed a thin haze which increased in density. The haze became a mist -- then a good solid fog of particles, atomic particles and even whole atoms. It wasn't green, or blue as has been reported, but an ultra-violet glow. The increasing density of the field caused a breaking effect. This breaking effect on every atom in the electron shell is vital to invisibility. It stopped the orbital motion. Electrons were slowed to a stop. That moment when they do stop, the enormous distances in atoms becomes apparent to the eye. If a nucleus were the size of a pea, the first electron shell would be about 2,500 miles out, on that scale. That is an enormous distance. Mostly empty space. When the electron shell orbital motion is stopped, the illusion of solidity is removed. That is the basis of invisibility. You are simply seeing the empty space. The next important thing is that the applied exterior force field prevents the nucleus from exploding. The beam is creating a super dense flowing magnetic field moving at the speed of light. It is moving from the electron shell to the epi-center of every atom in the effective mass. The instant jump of strength in the nuclear bond stops the detonation. "But you still have the transportation to worry about. The next important statement is that you have an imbalance of particles in the effective mass. This creates a particle hunger. The particle hunger has to be satisified once the force field developes because it becomes an acute particle hunger in the worst, and most serious way. There are three ways, at this point to cause the instantaneous transport. Let's say there are two ways for certain, and possibly a third way. Einstein tried two of the ways, and they worked. The experiment is repeatable. Repeatability is the criterion of science. I've never stated this before, but since this is my death bed statement, I will say it clearly -- IT IS REPEATABLE. The last step, is to utilize the Einstein Tunnel Theory. That will triple the speed. Proof exists right now that we can travel at 4.5 times the speed of light. If you want to talk about that I will, with examples that everyone can check. If you don't mind, for a moment, I'd like to pause and smoke a cigarette. I'm tired too, as I have been up all night." Carlos was nearly penniless. I loaned him $10 and drove him to the Greeley post office where he mailed out 5 copies of his most recent book: Roots of Controversy. He said that various people around northern Colorado had received copies of manuscripts, and documents of his life history. But, his national acclaim has come from his annotated copies of a book by an astronomer named Morris K. Jessup. Dr. Jessup had studied the Philadelphia Experiment and told associates that he had been hired to continue the research in 1959. On his way to another professor's house with his manuscript on "instantaneous displacement," Jessup allegedly committed suicide, by stopping along a road and inhaling carbon monoxide from his car. Jessup had apparently corresponded heavily with Carlos Allende in preparing the manuscript. "Are you afraid for your life?" I asked. "Always," he said. "I am perpetually in hiding. Foremost from Communist sources. One thing I will say about Jessup is that he did not commit suicide. Since this is my final statement, I will tell you that I met him about two years after his supposed death. We talked all night long. He had killed the man who was sent to kill him, and taken the man's identification. That's why there was no autopsy. Is Allende afraid of the U. S. Government? "No, not at all. They have given me some of the best protection I've ever seen. They have guarded my life. The U. S. has done a wonderful job, and I compliment them for such beautiful protection all this time. You see, my dream is the same as NASA's. My dream is for the United States to travel to the stars. If we build starships using Einstein's theory, we will never be short of natural resources like aluminum or copper, or iron. We will regain our number one position in the world. "But right now there are only four men in the United States who understand Unified Field Theory. I am one of them -- but I am not a scientist. My knowledge is from experience and from time with Einstein. He taught me what he could and made me understand. "We can have starships, and need them for defense. Imagine them out in space beyond the moon. Russia launches a nuclear attack. The starships could return with LASER cannon's blasting -- repeating LASER cannons -- capable of incinerating every major city in the USSR. It is reasonable. We could have a fleet of starships unrivaled in the world, starships capable of protecting America from surprise attack. Carlos said that he feels comfortable in Greeley, as we visited some of his favorite sites. These are his friends. People wave and smile at the bright-minded, colorful old man. He talks to strangers, too; winks at college girls, and flirts with beautiful women. Anyone who has met Carlos seems to remember the friendly, disheveled, out-going man. He speaks in various accents and languages. His Spanish is refined and intelligent. Few people know that Carlos Allende -- legally born Carl Allen in Kensington, Pennsylvania -- is a mystery to readers and authors all over the world. "I have been in Greeley off and on now for over thirty years. It is one of my favorite cities in the world," he said. "It is a farm town, people are close to the land, and the town is filled with farmers -- people whom I enjoy. Farmers are my own people, I was a farm boy, and though I have sailed the world, I am a farm boy at heart, and always have been. But also, Greeley is quiet, and the rent is reasonable," he said.